In some ways, Hallowe’en is the same in Germany as it is in the UK or the USA. You can expect nightclubs offering Halloween themed nights for adults, horror movies shown on TV, children dressing up and going trick or treating (although this aspect of Hallowe’en is not as common in Germany as it is in the US). Although Hallowe’en has no roots in German culture, there are a surprising amount of German traditions that are either similar to Hallowe’en, or that occur on or around 31st October. Some have a religious meaning and others are more commercial. 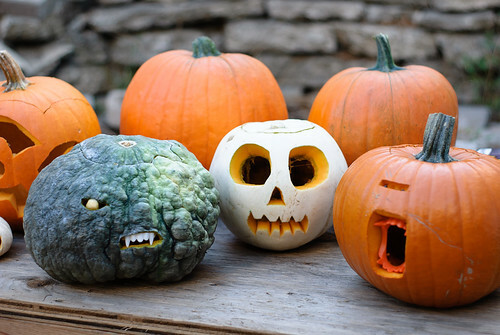 Read on to find out more about Hallowe’en celebrations in Germany. Being predominantly Catholic, Bavaria (Southern Germany) and Austria celebrate what is known as Seelenwoche (All Souls’ Week) – during 30 October and 8 November. This is a week of remembrance in which people attend church services to honour the dead, and visit their family’s graves with fresh flowers and lanterns. November 1st is known as All Saint’s Day (Allerheiligen), on which banks, post offices and schools are closed – this is another reason why Hallowe’en celebrations on 31st October are so popular! – and November 2nd is All Soul’s Day (Allerseelen), when a special mass is said at church, and candles are lit in honour of the dead. This week also remembers the saints who have died for the Catholic faith. Reformationstag is a protestant celebration remembering Martin Luther. It was on October 31st, 1517, that Martin Luther nailed The 95 Theses to the castle church in Wittenberg, Germany. In doing so, he started the Reformation – a time of religious and social change across Europe. ‘Luther Bonbons’ were created for people to remember Martin Luther in Germany on 31st October, so that Reformationstag was not overshadowed by Hallowe’en. Totensonntag, meaning “The Sunday of the dead”, is the protestant version of Allerseelen (All Soul’s Day), and is celebrated on the Sunday prior to the first advent Sunday. It is also known as Ewigkeitssonntag (Eternity Sunday). This is a 13th century castle located in Darmstadt, Hessen, alleged to be the inspiration for Mary Shelley’s “Frankenstein”. It holds a special Hallowe’en festival running from late October to early November, in which the entire castle is filled with gruesome shows and monsters, and you can explore it in its entirety. The castle is apparently haunted, too. It looks great. Click here to go to the website! This is a Halloween-like celebration celebrated in April, rather than October. It has its roots in German folklore; it is believed to be the night of a historic witches’ meeting on the Brocken, the highest peak of the Harz mountains. There, it is said, the witches communed on April 30 to welcome the arrival of Spring. 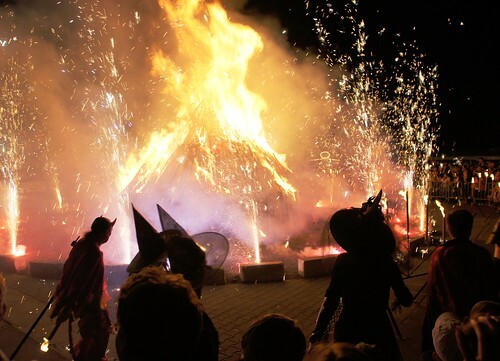 The celebrations of Walpurgisnacht involve bonfires, dancing, and dressing up in witches’ and devil’s outfits. Trick or Treating is called Süßes oder Saures (or Süßes, sonst gibt’s Saures), but it is not as popular in Germany as it is in the USA or the UK. This may be because, 11 days after Hallowe’en, children take part in the celebration St. Martinstag, where they go door to door singing songs with lanterns they have made themselves at school. They are then given sweets as a reward. St. Martinstag originated as a Catholic celebration in honour of Saint Martin, but is now celebrated across Germany even in protestant/secular regions, obviously without the religious emphasis. The Kürbisfest (Pumpkin Festival) is a commercial Hallowe’en celebration held in the town of Retz near Vienna each year. It includes a Halloween parade, pumpkins, costumes and parties. This is a family event. Click here for the official website if you’d like to know more. I hope this post has given you an idea of what Hallowe’en is like in Germany. With that, all there’s left to say is Happy Hallowe’en, everybody! What are you dressing up as this year?! Top marks if you can answer me in German!! We rather celebrate St. Martins Day with the traditional Martinsgans. Btw, before Totensonntag there is “Buß- und Bettag” (on wednesday), nowadays only in Saxony a holiday.